Easy Paleo Coconut Milk Curry Chicken - Oh Snap! Let's Eat! By the way, this dish is super customizable! Want to spice it up? Add chilli powder or jalapenos. Love veggies? Try mushrooms, green/red peppers, cauliflowers, and more! Just wanting to try different flavors? You can try lemongrass or basil too! I also would like to let you know that the curry powder you use could impact the taste a lot, so choose a good one! A few suggestions are: Thai, Chinese, Jamaican, Indian. In a large skillet , heat up your butter on low heat. Once it melts, add curry powder and swirl it around until well blended with a spatula. Add in the can of coconut milk , and swirl it around. Continue heating the coconut milk blend, while in a separate skillet, sauté the garlic and the onions with the cooking oil of choice. Once the onions are translucent, add in the cubed chickens. When the meat is cooked very lightly, add the cubed sweet potatoes and sautéed chicken/onion/garlic mix in to the coconut milk mix in the other skillet. Mix well together, and turn the heat up to high. Once it starts simmering, lower the heat to medium low, and cover. Let it cook for about 30 minutes or when your chicken is cooked thoroughly, occasionally stirring. In a large skillet, heat up your butter on low heat. Once it melts, add curry powder and swirl it around until well blended with a spatula. Add in the can of coconut milk, and swirl it around. I love coconut curry and this one sounds simple delish! This looks delicious and I’m planning on making it for dinner tomorrow but, I was wondering, at what point should veggies like peas or mushrooms be added? During the simmer? I wanted to add some peas (probably of the frozen variety hehe) but I wasn’t sure at what point I should add them. question: how many servings does this recipe make? I though possible 3-4 with the 4 thighs, but then with only 1 sweet potato, I just wasn’t sure. Hi there! I serve 2-3 people with the amount in this recipe. I guess it depends how much you eat! So what makes this a ‘Paleo’ dish other than the word ‘Paleo’? 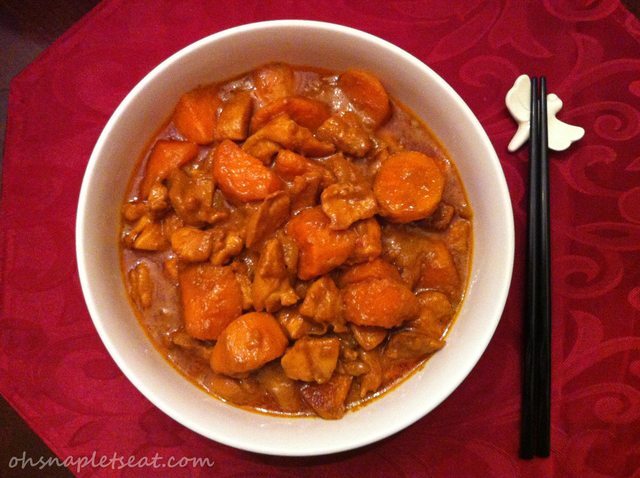 How is it different from this recipe http://ohsnapletseat.com/2013/05/20/easy-coconut-milk-curry-chicken/ posted 13 months ago prior to ‘Paleo’ becoming the new cool word to add to a recipe name? Hi there! Very good question – the “paleo” distinction between the two can be moot depending on how you eat paleo. (I do kind of talk about the difference between this this one and the old one in the first paragraph but it’s okay if you missed it, I will make it more clear here!) Originally, white potatoes are not considered paleo. Nowadays, the paleo committee are mostly fine with it. Since I know some people out there would not care for the original recipe because they do eat strict paleo (no white potatoes) I made this variation for them. As for adding the word “paleo” to recipe names to make it more “cool” – I didn’t know it worked like that! If I did, I would’ve slapped that word on more of my recipes that are really considered paleo! :P Anyway, the point is – if you don’t eat paleo and are ok with white potatoes – go ahead and go at the original recipe! Delicious!! Everyone asked for the recipe. I love adding sweet potatoes instead of white (am also going to try with butternut squash). Added some frozen peas for some green at the end, which was great. Served with jasmine brown rice. One of our new family favorites! Hi there, welcome from the UK. I’d just like to tell you that your coconut curry is the tops. Yum! I love zucchini! I will have to try that some time! Looks great! I think I will use white potatoes instead of sweet and add some fresh ginger, cilantro and scotch bonnet peppers. The curry was really good. I like it and the hubster did too. hi there, could i make this recipe with chicken breast instead of thigh? Do you think the chicken could be swapped out for salmon somehow? I’ve never tried that, and I don’t see a solid reason why not… but I’m not so sure the taste will go together. If you really want to try it, I suggest you cook the Salmon separately, and then cook the coconut curry sauce separately and then pour the sauce over the Salmon afterwards. Let me know if you try it! I’m curious! Thanks!